During Libby Palmer’s five-year absence from Port Townsend, Judy D’Amore completed her teaching degree. She’d hoped to get a teaching job in Port Townsend but that year there were hundreds of applicants for only a handful of teaching positions. But as luck would have it, Judy was offered a full-time teaching job at the Poulsbo Marine Science Center (now the SEA Discovery Center). 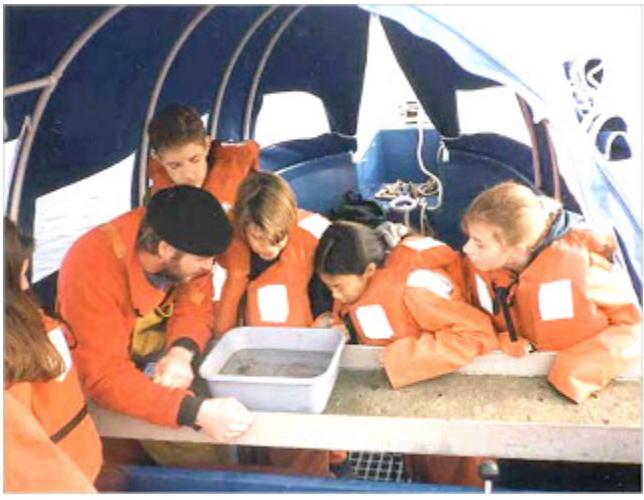 The Poulsbo center, which delivered hands-on marine science programs to nearby school districts, reached out to the Port Townsend School District and soon had a contract that allowed Judy to spend part of her time teaching Port Townsend students at the PTMSC. Locally, Judy taught 2nd, 4th and 6th grades using the Poulsbo center’s curriculum. She soon added new programs for kindergarten and the district’s multi-age classrooms. “I learned so much working at the Poulsbo Marine Science Center, and I loved bringing classes to our own Port Townsend Marine Science Center,” says Judy. It was also during this time that Judy and her friend Debra Bouchard started the Port Townsend Bay Monitoring Project, or MOPO. The two wanted to monitor the health of bay with the help of middle and high school students. Other programs were piloted during these years as well. Several marine summer camps were offered, plus an Elderhostel session. The Octopress Newsletter was started by a creative friend and continues to this day. (Read an excerpt from the Fall 1990 Octopress.) The PTMSC also began holding annual Low Tide Festivals to celebrate the summer’s lowest tide with beach activities for all ages. 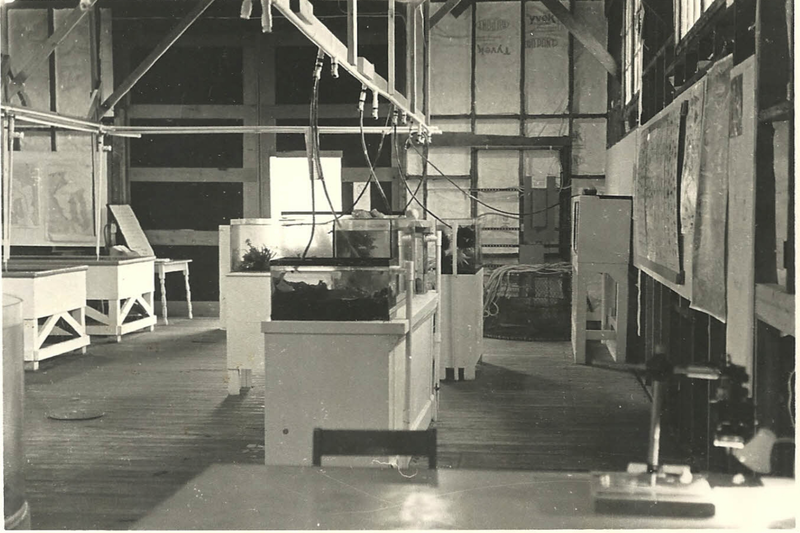 PTMSC Marine Exhibit in the early years. The PTMSC building on the pier was further modified to meet changing needs, using salvaged materials from the park and elsewhere. The interior, originally a single open space, was partitioned with the main exhibit located at the south end, a classroom at the north end (much as it is today), and a fully enclosed office along the east wall. Still, with Libby away and Judy now working in Poulsbo, there were challenges simply keeping the PTMSC doors open. Washington State Parks had prohibited charging admission to the exhibit, so money was tight even for maintenance. Judy worked initially as the park’s seasonal part-time naturalist, which paid for some of her time in the exhibit, but once she began working full time she had to quit and received no further compensation for managing the exhibit or coordinating PTMSC activities. “I was really struggling,” says Judy. “I knew I couldn’t keep it going as a volunteer and couldn’t expect others to that, either. We had to find some way to get funds to hire paid staff. 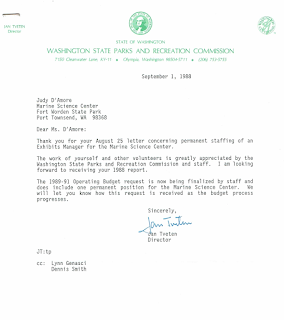 Judy had routinely asked the Washington State Parks department to provide some financial support to the PTMSC for its service to park visitors, but her efforts were unsuccessful. So, she took another tack. It was at that point that Judy reached out to Centrum Executive Director Joe Wheeler, the head of a non-profit arts organization based at Fort Worden. Wheeler explained that his organization received some of its funding through the state legislature. He advised Judy to lobby several key legislators, asking them to place a line item in the state parks budget for funds to support the PTMSC. Judy and a committee of advisors decided to ask the legislature for $30,000 annually, equivalent to one full-time position at the state salary scale. It seemed an enormous sum and they were sure it could pay for at least three people. And so Judy, her ex-husband Frank and their friend Diane became unofficial lobbyists. “For Frank the challenge of lobbying the legislature was very exciting. His attitude was ‘We can do this!’” Judy recalls. 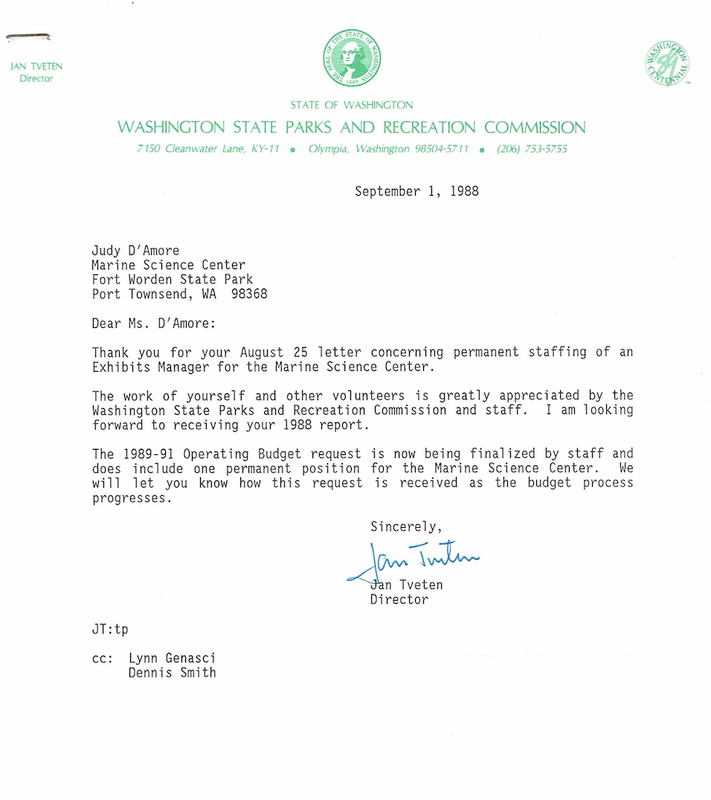 In 1989, after several all-day trips to Olympia, the group received some welcome news: The legislature had allocated $30,000 to support the PTMSC for the next two years. Although the funds would be short lived, they allowed the PTMSC to hire several paid staff to pursue other funding sources, support its volunteers, and maintain the marine exhibit. Among those hired in 1989 was Anne Murphy, who went on to become the PTMSC’s executive director for 24 years. Judy supported the move because she preferred teaching marine science to administrative duties. When the Poulsbo Marine Science Center changed management several years later, she continued teaching at the PTMSC and also running the MOPO project. Meanwhile, Libby – then based in New York – was working on a National Science Foundation project grant to involve more girls in mathematics and science. “The work required me to travel around the country, and I had a wonderful boss who suggested I could fly out of Seattle as easily as I could from New York City,” says Libby. 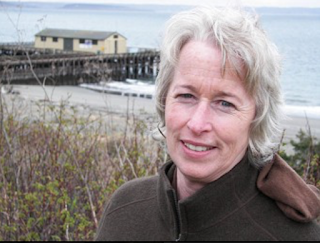 “That meant I could live in Port Townsend again.” And in 1990, that's exactly what she did.